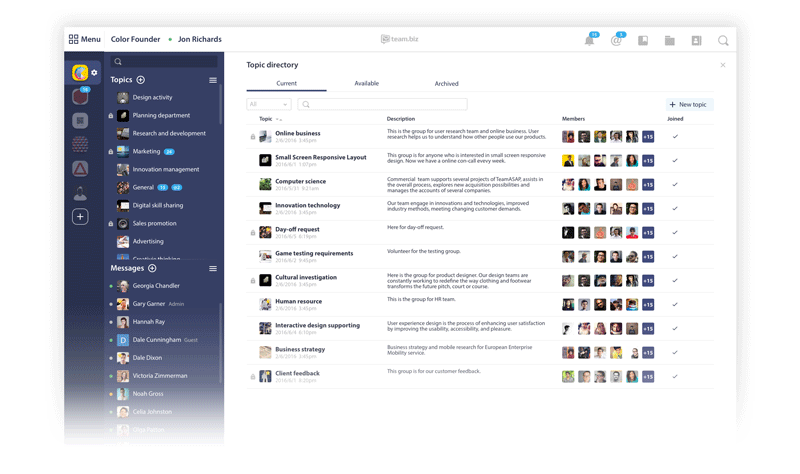 We’ve just released a few great improvements for Team.biz. Our improvements for this release include more detailed notifications to you about application usage and improvements to the design. Team admins will now be sent a monthly report of Team.biz usage about their team. You will be notified when someone you’ve invited to Team.biz has logged in and started using the app. You will be emailed notifications when you haven’t been in the app latetely. We'll also let you know when you don’t have a mobile device that has notifications enabled. Of course, you can disable email notifications if you’d prefer to. Our message and reply boxes are now more responsive and have a friendlier design. We've also improved the team topic directory by giving it a new and simpler design. Remember that you can get to your topic directory to join and browse new topics by clicking on "Topics" on the right sidebar.